1960 Kôgi no Kôshin (1960の抗議の行進) - Protest March of 1960, the seventh design from the series Hyakunen no Hana - Flowers of a Hundred Years, self-printed in an edition of 100 in April 2016. Paper size: 33.5 x 47.5 cm. Series title and print title in blindprinting in the top left margin; signed in blindprinting and pencil in the bottom margin. The seventh of a series of 10 bijin prints illustrating women in the decades of the 20th century. 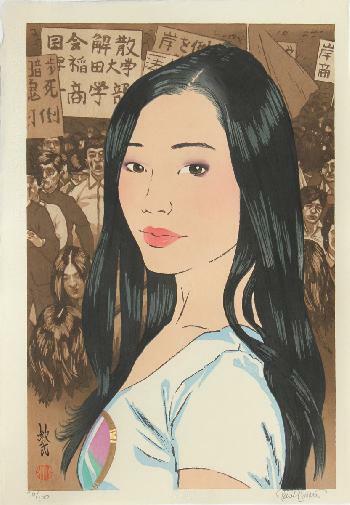 This print shows a beautiful young woman turning away from the melée of a protest march against the government's decision to continue to allow US military bases on Japanese soil to hold nuclear weapons.